New players only. Min deposit £5. Max bonus £50. To withdraw winnings connected with bingo bonus funds, wager 4 times the deposit + bonus funds. Withdrawal restrictions apply. Bonus available for use on bingo games only. From the moment you land on the home page at City Bingo you will be confident that you are going to have a great time playing at this site. The Cheshire Cat style mascot welcomes you with details of the welcome offers, free bingo games and much more. The site may have a familiar feel for some players and this can be attributed to the fact that this brand is brought to you by the same company behind Costa and Sing Bingo, another plus point in City Bingo’s favour. The aesthetics of the home page aren’t too heavy on the eyes with a lot of colour and a great logo making this a site that should be tried on for size. Unlike many brands powered by the 888/Globlacom/Cassava software, City Bingo doesn’t ask that you provide financial information during the registration process and with one free bingo room open to ALL players, deposited or not, you really can “try before you buy”. However this site is prone to changing their welcome offers for new players and should a no deposit welcome bonus be offered then financial details are required at registration in order to qualify for the free money. You don’t even need to validate your account via an email link in order to access the no cost games available at this site! 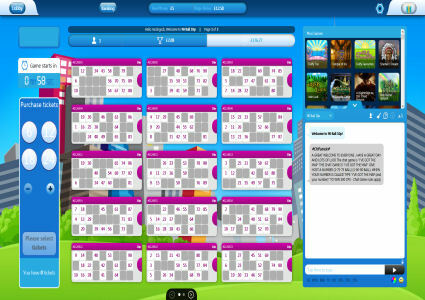 When it comes to the number of rooms available and variety of games on offer, City Bingo does ok. Like all brands on this software platform there is currently only 75 and 90 ball games available. If you’re looking for 80 ball bingo then sadly this brand has yet to introduce this variant of the game to their site. However what they lack in variety of bingo games, City Bingo more than makes up for in their selection of instant win games. Firm favourites like Cleopatra and Fluffy Favourites can all be found here. 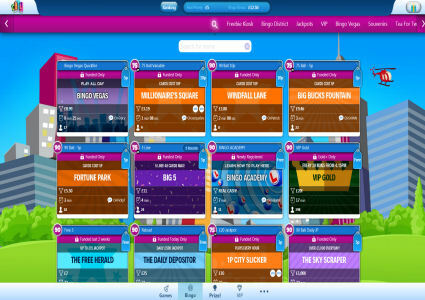 From the bingo lobby you can choose from various tabs to help you find what you are looking for, from free bingo to jackpots and instants, they are all there. City Bingo offers a pretty impressive selection of guaranteed jackpots each and every week and what we really liked is that ticket prices are cheap! With seven guaranteed jackpots on offer each and every week; three of those are free to enter, but you will pay no more than 10p per ticket even if you do pay. This is just a little of what City Bingo has to offer, for all the latest offers and promotions from this brand read our online bingo news section of visit the site directly. 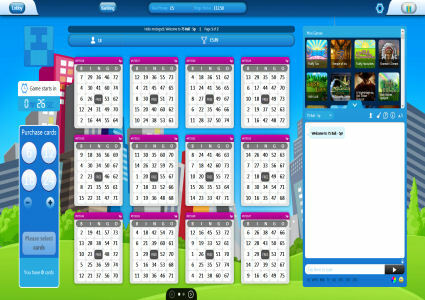 You can customise your game play at City Bingo to suit your preferences by using the “options” button above your chat room. Here you will find General, In Game, Chat and Card Price Alert. You can either manually mark your cards or allow the computer to do it for you; the latter is the default setting. All bingo calls are automated so even if you mark your cards yourself and miss a number, the system will still recognise your win. City Bingo have launched their Diamond Club and here you are be able to exchange diamonds for real cash or bonus cash. They say diamonds are a girl’s best friend and they could certainly be your best bingo friend when playing here. If you like a quick spin on the slots or a turn of the card on Video Poker then you won’t be disappointed with the array of instant win games available at this brand. City Bingo boasts a great selection from multi-line slots to casino style games and each opens in a new window so as not to interrupt your bingo game.